GENERAL INFORMATION: You are looking at a 1992 Corvette convertible that is just 17,513 MILES FROM NEW!!! You might recall that in 1992 GM introduced the LT1 engine giving this Corvette a very nice performance boost. This exceptional 1992 Corvette convertible has not been modified (mechanical) according to the owner and retains is factory-built driveline. It has been very well maintained and runs and handles like it was new. The Corvette is located in ALABAMA. OPTIONS: • Paint code 41 Black • Interior Code 193 Black/leather • AQ9 Sport Seats • LT1/350ci, 300hp engine • Automatic transmission • ASR Traction control • FX3 Selective ride and handling electronic • AC1 & AC3 Power seats • CC2 Auxiliary hardtop • C68 Electronic AC Control • UJ6 Low tire pressure warning indicator • V56 Luggage rack • Plus all the wonderful standard features. As you will see this Corvette has an aftermarket JVC radio and C5 aluminum wheels. Note: The owner has the original radio. Yes, the original spare tire and jack are still in the Vette. CONDITION RATING: (Using a perfect 10-high scale): The owner rates the overall condition of his Corvette as a strong NINE. All the normal maintenance has been done. This 1992 Corvette convertible survivor is ready for you to enjoy. 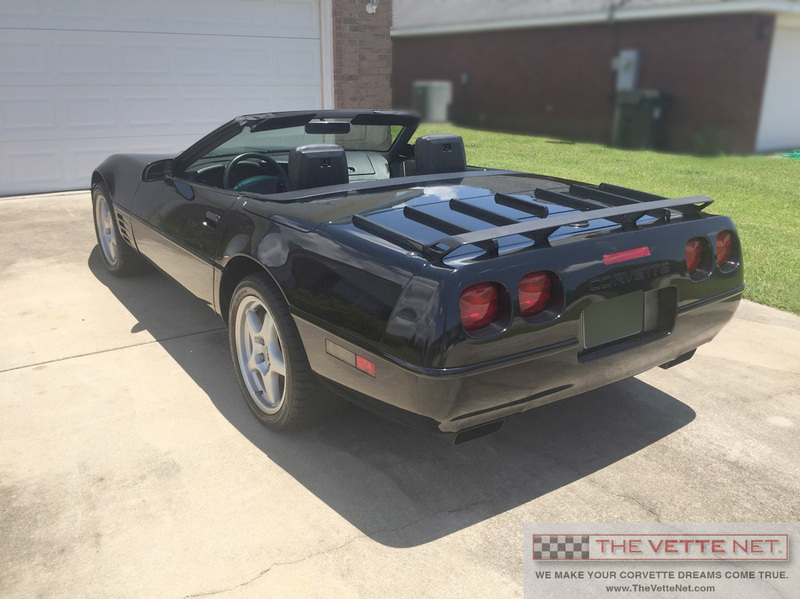 TAKE THE NEXT STEP: This beautiful Black 1992 Corvette convertible is privately owned and listed with THE VETTE NET. We are a professional Corvette broker service and proud Lifetime Business Member of the National Corvette Museum. No matter where you live, delivery can be arranged anywhere worldwide at a reasonable cost. I am very experienced working with international Corvette enthusiasts and welcome all inquiries. DO YOU HAVE A CORVETTE FOR SALE?